BARG has started work on the latest phase in the Peasemore project – investigating the medieval origins of the village by a sampling strategy of excavating a series of 1m x 1m ‘test pits’ in gardens in order to establish the ‘historic footprint’ of the village. The ‘test pit’ technique is now a well established method of investigating the origins of medieval villages, having been used in the Whittlewood project run by the Medieval Settlement Research Group and of course C4’s Time Team. The technique is aimed at the rapid sampling of archaeology within areas where more extensive excavation is rendered impossible by modern settlement which can often overlay evidence of past settlement. Rather than relying on finding significant archaeological contexts within particular test pits, the technique relies on analysing the geographical spread and chronological pattern of finds (especially pottery) from a number of test pits scattered across a village. For Peasemore, our working theory is that the original medieval settlement may have clustered around the area of the church and the northern edges of the ‘enclosure’, perhaps dating to the late Anglo-Saxon period or the early Norman era, when the construction of a church is recorded. The later medieval expansion of the village may then have extended the settlement further up what is now the main north-south street in Peasemore. However, this is of course simply conjecture at this stage, and does not allow for several complexities, such as the tendency of medieval (especially early medieval) settlements to shift location. To test these theories out BARG has so far excavated five test pits in gardens in the village over the weekends of 17th/18th June and 1st/2nd July 2006. The locations of these pits are plotted on the 1882 1st edition 6 inch OS map shown in figure 1. The finds from these pits have to be washed and analysed before we can start to piece together the evidence in earnest (see elsewhere in this newsletter for details), so for the time being only a brief summary of each pit is presented and any statements about the dates of pottery should be treated with caution. Following the now established technique, each test pit was excavated in artificial ‘spits’ of 10cm depth unless archaeological features were uncovered. The pits were recorded just like a normal excavation using context sheets, and a detailed photographic record has also been made (see fig 2). TP 1 was located in a modern garden lying about 30m west of the main north-south street through Peasemore, although the 1st edition 6 inch OS map shows that it was previously in a field that adjoined the back boundary of a row of cottages that lined the main street. These cottages were demolished in the 1950s with modern housing built further back from the road. Gardening in this area had previously turned up pottery sherds of possible Iron Age, Roman and medieval date, including a heavily flint-tempered sherd of possible 12th or 13th century date(see fig. 3). 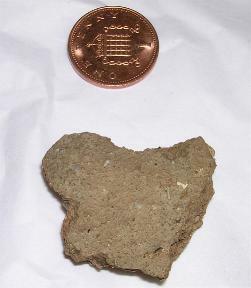 The top four spits of TP1 produced a number of pot sherds which appeared to date from a similar range of periods – Iron Age, Roman and several sherds (perhaps from the same vessel) with a distinctive yellowy/green glazewhich may be 13th or 14th century in date. This mix of finds appeared to result from past churning, perhaps ploughing of the soil, and indeed a distinct marling layer was also visible in the upper levels of the pit (see fig. 4). Eventually the quantity of finds in TP1 declined as the pit reached a natural layer of reddish brown clay with flints below a depth of c. 55cm. TP2 was opened in a garden in Mead Close, a relatively modern housing development to the rear of the Village Hall, about 55m west of the main street. S1, the first layer under the turf, consisted mainly of a mid brown loam with various inclusions. These were mainly flint, some of which was worked, but a few sherds of pottery were found. These included one sherd believed to be prehistoric and another possibly Saxon. There was also a large lump of tarmac, the first sign of the modern builder’s rubbish which filled most of the second spit. As well as clay, bricks and mortar we even found a coke can. Underlying this, in the third spit, was a rich, black loam. We interpreted this as probably having been the natural surface before the house was built. This was a deep layer and continued down through spits 4,5 and 6, with the natural subsoil beginning at spit 7. There were few finds throughout these levels. TP 3 was located in The Beales, another modern housing development to the far west of the village. In addition to its convenient position next to Peasemore’s only pub the location of TP3 allowed us to test our ideas about the extent of the ‘footprint’ of the medieval village. The site is shown to be just within a field on the 6 inch 1st edition OS map, although Rocque’s map of 1761 shows a schematic-looking pair of buildings extending along the lane heading westwards out of the village. In the event TP3 did not produce any obvious medieval finds, although potentially worked flint was again present. 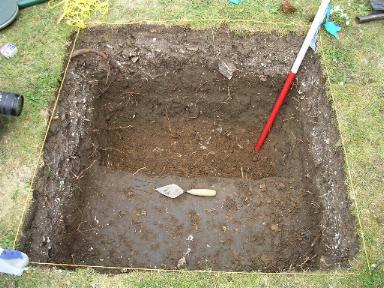 The natural layer of clay with flints was met at the shallow depth of 28cm in this pit. TP 4 & TP5 were located close together in the northern extremity of the village, an area known as Mell Green, which map evidence suggested was only settled from the late 18th century onwards. The results from TP4 provisionally confirm our suspicion that the site is situated outside the medieval village. The finds have yet to be washed and analysed, but a preliminary inspection indicated the presence of some worked flint (covering Mesolithic – Bronze Age), with the rest of the material confined to the 19th and 20th centuries. Thus, pottery sherds were generally glazed, while metallic items include a number of nails, a broken tanged knife, wire, a button probably from a 20th century greatcoat and part of a pocket watch. Glass was present in mostly small fragments, but the pièce de resisténce was a complete 4oz jar of Marmite (empty of course!). There were only a few fragments of animal bone. TP 5 was situated in a garden just over the road from TP4, but presented a very different aspect in terms of the texture and consistency of its soil. The upper two spits contained a significant quantity of what appears to be worked flint, along with some modern pottery and CBM. At a depth of about 20cm several very large sarsen stones were found to dominate one half of the pit, restricting further excavation to the remaining half. The third and fourth spits were dominated by a very chalky deposit which again contained flint, some modern looking shiny glazed pottery and a quantity of apparently unarticulated small animal bones. At a depth of about 35-40cm the natural reddish clay with flints was encountered, the lack of finds at this depth and below confirming that this pit had reached a natural layer. The apparent lack of medieval pottery from the test pits at the western and northern edges of the modern village (TPs 3, 4 & 5) would confirm our suspicion that the medieval footprint of the village did not extend into these areas. If confirmed, the suspected later medieval finds from TP1 would also fit in with the theory that the main street was an extension of an earlier core settlement. However it is early days yet for this project and the next aim is to place some test pits nearer to the church and enclosure to investigate our ideas about origins of village. The next weekend of test pitting is likely to be the 9th and 10th September. 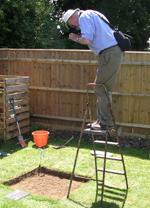 Thanks are due to the 15 BARG members who took part in the excavations over the two weekends in sweltering conditions, including Lindsey Bedford (metal detecting) and Tony Booth (photography) who also deployed their specialist skills. We were grateful to Geoff Fairclough for help on finds analysis, to Duncan Coe & Sarah Orr (West Berks Heritage Service) for visiting and offering advice and, of course, to the five householders who volunteered to allow BARG to (temporarily) despoil a small part of their lawns.